Adventures have been had. 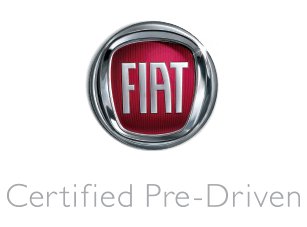 And new ones await those lucky enough to get behind the wheel of a FIAT Certified Pre-Driven vehicle. Each one has to pass our demanding certification process that guarantees only the finest late-model vehicles make the cut. Every vehicle that passes is then 100% inspected and goes through a thorough reconditioning process using Authentic Mopar® Parts. Add to that a factory-backed 7-Year/100,000 Mile Added Care Plus Warranty, (1) 24-Hour Towing and Roadside Assistance, (2) Car Rental Allowance (3) and CARFAX® Vehicle History Report and you don’t have just any used vehicle, you’ve got one that promises to inspire a celebration of personal freedom. 7-Year/100,000 Mile Powertrain Warranty from original new car sale date. 3-Month/3,000-Mile Maximum Care warranty from CPOV sale date. The title may prove you own it, but when you’re ready to let everyone else know it’s yours and only yours, there’s no better way than adding Authentic Accessories by Mopar®. From chrome enhancements to spoilers and side moldings to bike, snowboard and ski racks, each Mopar accessory has been thoroughly tested and factory-approved. Don’t settle for anything less other tha Authentic Accessories featuring fit, finish and functionality specifically for your FIAT®. Find out more at your local FIAT Studio or visit mopar.com today.